There are a few different options for implementing state machines in a Rails application; spree, for example, uses the state_machine plugin. Personally, I prefer the acts_as_state_machine gem (aasm), as I’ve found it to be a bit easier to use and understand. Notice that the event :submit is the present tense verb form of the state :submitted. And when the submit event is called, the Book::Order object’s state will transition from one state to the other. That’s pretty much all you really need to implement a state machine. But of course, we’ve only got two states here, which isn’t really much of a machine and definitely doesn’t take advantage of all the functionalities that aasm provides us with. Whoa – now we’re talking! This state machine is even more complex than the diagram we started off with! You’ll notice that we even have a state :returned and an event :return, which transition from a complete state to a returned one. And if you’ve got a really good eye, you’ll see that the process event has changed, too. Now, we can call the process event on the object when it’s either in the submitted state or the returned state. Our state machine is now a self-referential structure, which means that the process event looks back to states within the machine to determine whether it can continue forward or not. This all seems pretty cool, but you better buckle in – it’s about to get even cooler. It’s lovely that we have this machine and all, but what’s the fun if you can’t take it out for a whirl? So, let’s see what this thing can do. Protip: If you’re not a big fan of raising exceptions in your application, just add aasm :whiny_transitions => false do right inside of your class, and you’ll return basic boolean values instead of exceptions. Whew! So that’s a lot of methods. But we didn’t have to write any of them! Isn’t that fantastic? Hopefully the usefulness of state machines is starting to come together now. Remember before we knew what a state machine was? How would we have had to handle all of this functionality? Make a migration that adds a state or status column in our Book::Object class, with a string value. Give the state column an initial default value of unplaced. Add an instance method called unplaced? with a boolean return value. Add another instance method called submit, which changes the object’s state property from "unplaced" to "submitted". Add yet another instance method called submitted?, with (at the very least), a single-line if conditional. Add some more instance methods for good measure, all with some logic in them to keep track of our object’s state. Repeat steps 3-6 for every single new state we wanted to add. If we compare this horrifying list to our state machine, it’s pretty clear that our machine takes care of all of this! Yes, it requires a little bit of setup when we create our class, but come on, it’s like, four lines of code for each state! So much better. And you get all these methods for free! And they’re pretty powerful, because we can call them anywhere in our code, on any instance of our object. But can we customize this machine even further? Heck yes, we can! Whenever you want a specific event to call a particular method, simply pass a block to the method. The block will only be called if the transition occurs successfully. The aasm documentation defines a list of different callbacks you can use for your transitions; the callbacks will only be triggered when certain conditions are met (for example, when you exit a particular state). # that the `Order` has been deleted. These callbacks work exactly as you might think, hooking into either a state or an event. Before the Order switches states from processed to shipped, the print_return_label method will fire. But the send_delete_confirmation method will only be called after the delete event is finished – only after the transition from processing to deleted occurs successfully. If you want to only allow a transition if a particular condition is defined; if the guard returns false, the transition will be denied, and will either return false or raise an error. transitions :from => :unplaced, :to => :submitted, :guard => :payment_successfully_processed? These are just three things you can do to spice up your state machine. Creating a state machine with this gem gives you a fair amount of flexibility. You can use multiple guards or build multiple transitions for a single event. As your state machine grows, you can call the aasm.current_event to keep track of where you are in your code. Now that you know how to implement a state machine, hopefully you now realize the value in them and don’t feel too intimidated. As long as you take it a step at a time, you can create your own state machine, with the exact kind of functionality your program needs. With that said, there’s only one thing left to do: go forth implement one yourself! Fly young grasshopper, fly! 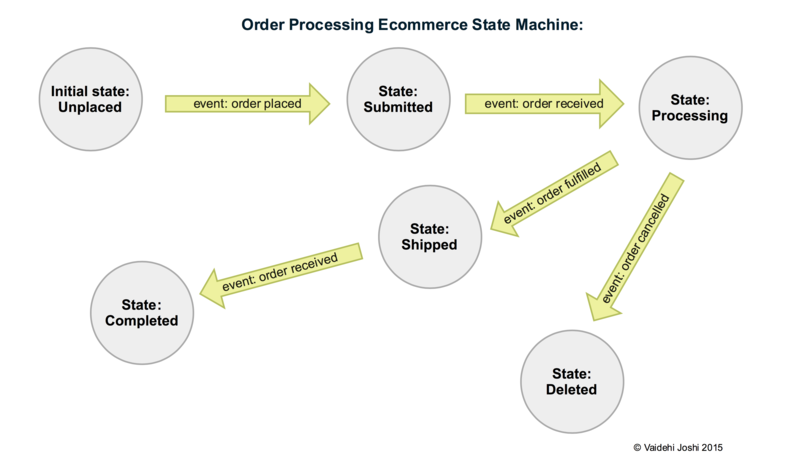 State machines can be broken down into states and events. Events control the flow of one state to another. Each event has a from and a to transition. Only if a transition occurs successfully will an object’s state change. You can manipulate how an event or transition works using callbacks, blocks, and guards. Find more great blog posts that implement FSM’s here and here. And if you want to get really fancy, learn how to use this!